Choose from hundreds of Radiology CME courses that can be sorted by modality or subspecialty. Certificate management is easy and courses are $15/credit hour. We offer free e-mail support for members taking classes. 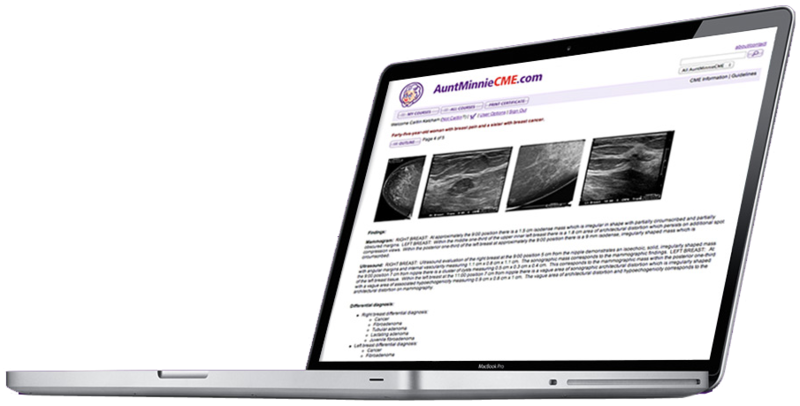 AuntMinnie.com, in conjunction with Voxmedia, LLC, have teamed together to provide continuing medical education (CME) credit for physicians and other healthcare professionals. Each course integrates knowledge, imagery, and dynamic interaction to enhance learning via the Internet for medical imaging professionals and those that support medical imaging professionals. Our Radiology CME courses deliver choreographed, interactive knowledge to simulate real-time interaction with a radiologic expert. There are built-in mechanisms for assessment, certification, and credentialing of course participants. If you are a physician, sonographer, physician's assistant, nurse practitioner, or nurse (depending on the nurse certifying body), you can earn continuing education credit.